It's about 15km hike from Mt. Takao to Mt. Jinba, but since I'm a beginner in hiking, we decided to "cheat" by using a chair lift like in this picture. I've heard that Mt. Takao is really crowded in autumn as many people come for the beautiful autumn leaves, but it was more than I expected! We had to line up for the chair lift for like 30 minutes. There was a long line up for cable car as well. There were many people! Mt. 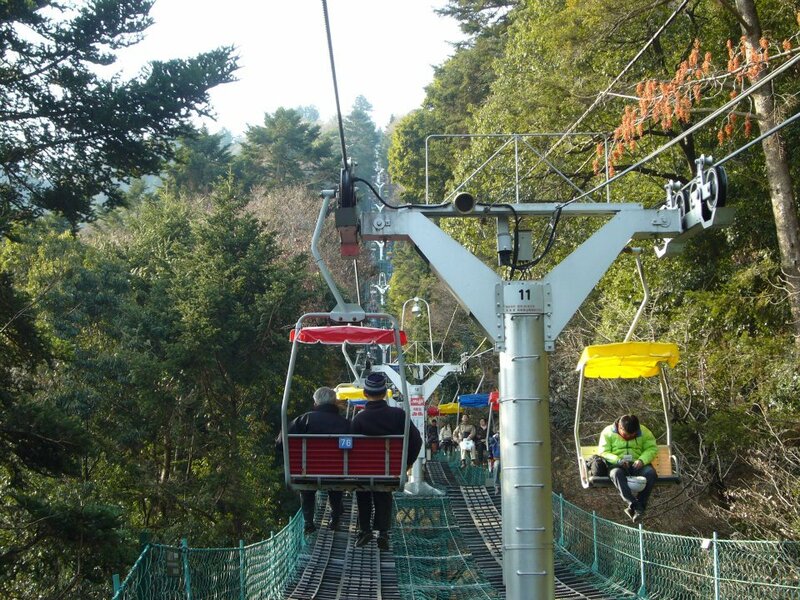 Takao is one of the "100 Mt. 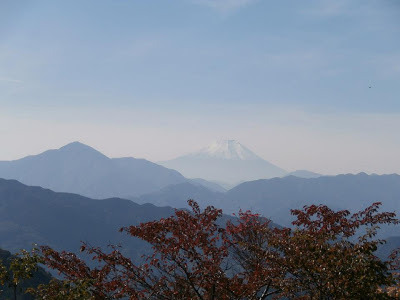 Fuji Viewing Spots in Kanto" basically meaning that you can have a great view of Mt. Fuji, one of our most beloved mountains in Japan, in the distance. 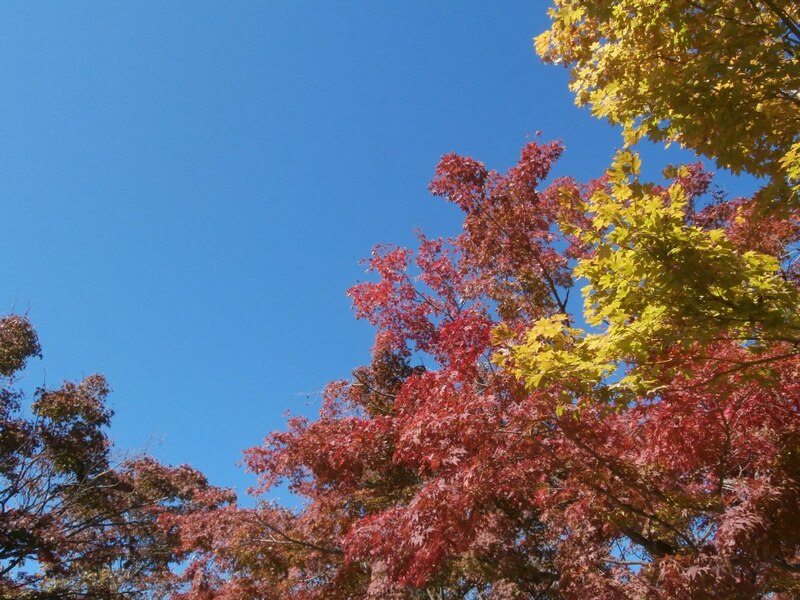 :) It was a clear blue sky, so we had a great view of Mt. Fuji. 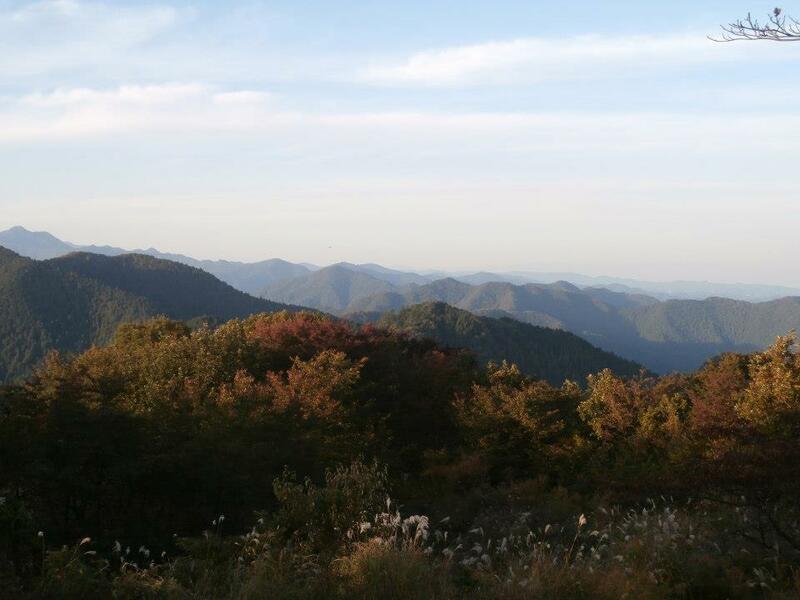 In the picture, the mountain with its top covered with snow in the distance is Mt. Fuji. When we arrived at the top of Mt. Takao, I was surprised how crowded it was! I think Mt. Takao has become way too famous since it received 3 starts in the Michelin Green Guide. Lately I've seen many advertisements for hiking there (even TV commercials), so it has become more like a touristry site esp. on the weekends, I guess. :( I'm not a big fan of being in the crowd, so we left there almost right after we got there and headed to Mt. Jinba. We stopped at a small rest area for lunch. This is the view we enjoyed while having lunch. :) I loved those mountains, mountains upon mountains, layered upon another like artistically torn pieces of wrapping paper. And finally on top of Mt. Jinba! OK, this doesn't look as amazing as it actually was due to my horrible camera skill, but it was really beautiful! lol It was about 5 hours walk from Mt. Takao to Mt. 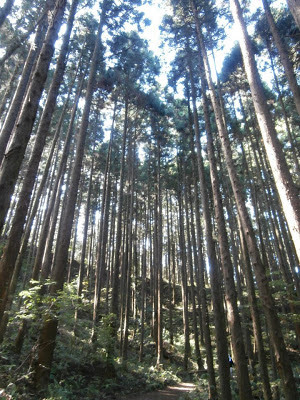 Jinba, much longer than I expected it to be, but I really enjoyed the beautiful afternoon! :) It was really refreshing!! 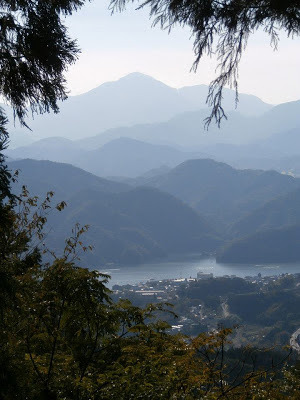 If you like hiking and decide to come to Japan, you might like to take the same path that I took. :) Do you like hiking? Where would be the most famous hiking spot in your area?